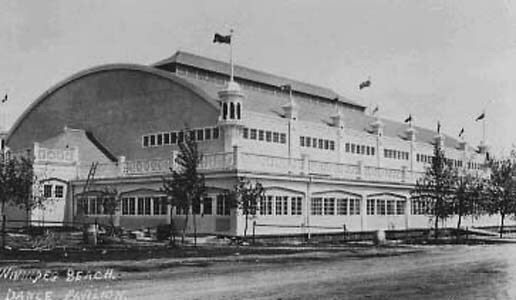 Dance Pavilion at Winnipeg Beach, 1911 (Archives of Manitoba, Still Images Section. In the late decades of the nineteenth century, urban North Americans sought refuge from congestion, noise, and pollution. As the environmental problems of industrial cities grew worse, city councils across the continent established urban parks while federal governments in both Canada and the United States developed national parks systems. Parks, as constructed natural spaces, were just one option for city-dwellers seeking relief from polluted urban environments. Many flocked to the shores of oceans, lakes, and rivers where beach side resorts emerged as yet another recreational destination. At the beginning of the twentieth century, Winnipeggers turned to the shores of Lake Winnipeg to the north of the city in the hopes of finding an outlet for their leisure time. There the Canadian Pacific Railway established the beachside resort community of Winnipeg Beach. For more than half a century, Winnipeg Beach was one of the most popular recreational retreats for Manitoba’s urban population. Thousands of people enjoyed the lake views and boardwalk entertainments of Winnipeg Beach for many years until the community went into decline by the end of the 1960s. On this episode of the podcast, we discuss the history of Winnipeg Beach with author, Dale Barbour. Please be sure to take a moment to review this podcast on our iTunes page and to fill out a short listener survey here. Barbour, Dale. Winnipeg Beach: Leisure and Courtship in a Resort Town, 1900-1960. Winnipeg: University of Manitoba Press, 2011. Kheraj, Sean. “Episode 28: Winnipeg Beach” Nature’s Past. 22 February 2012. Sean Kheraj is the director of the Network in Canadian History and Environment. He's an associate professor in the Department of History at York University. His research and teaching focuses on environmental and Canadian history. He is also the host and producer of Nature's Past, NiCHE's audio podcast series and he blogs at http://seankheraj.com.